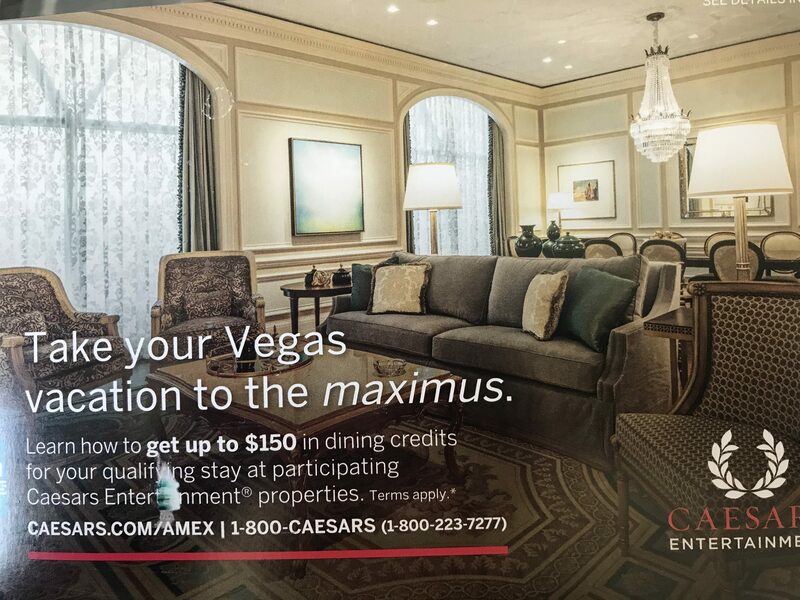 This weekend I received a snail mail offer from Amex and Caesar’s Las Vegas properties for up to a $150 Dining Credit on 2 night stays in suites. You’ll receive a dining credit of up to $150 when you book a stay of two or more consecutive nights in a suite at a participating Caesars Entertainment property and pay with any American Express Card. A $150 dining credit per stay at either Caesars Palace or NOBU Hotel. A $100 dining credit per stay at Paris Las vegas, Planet Hollywood Resort & Casino or The Cromwell Hotel and Casino. A $75 dining credit per stay at Bally’s Las Vegas, Flamingo Las Vegas, Harrah’s Las Vegas, The LINQ Hotel and Casino or Rio All-Suite Hotel and Casino. Offer only valid for stays of two consecutive nights or longer in select suites at Caesars Palace, Harrah’s Las Vegas, Bally’s Las Vegas, The Cromwell, Nobu Hotel at Caesars Palace, Flamingo Las Vegas, The LINQ Hotel & Casino, Paris Las Vegas, Rio All-Suite, and Planet Hollywood Resort & Casino. Reservations must be made by March 13, 2019. Offer begins December 15, 2018 and is valid for stays through March 31, 2019. Offer valid online or by phone using promotion code AMEX19. To redeem your offer, visit Caesars.com/AMEX or call 1-800-CAESARS (1-800-223-7277). Dining credit valid at Caesars Entertainment–owned restaurants only. Dining credit does not include taxes, fees, or gratuities, is applied one per room, and is not transferable. I did a quick search for suites at Caesars and there were plenty of dates available. Remember to book using your Total Reward’s number so that you’ll earn tier credits and any elite benefits you’re entitled to. In order to receive the credit you must use the promo code AMEX2019 and pay with any Amex card.